Mother and daughter both wear Ferris Corsets in this ad from March, 1914. Delineator, page 65. “Made in more than 100 styles to properly fit all ages, infants to adults.” Ad for the Ferris Waist; Delineator, March 1914. The full ad for Ferris Waists, March 1914. The girls at the bottom seem to be teens. The one at left appears to be leaning forward while using some kind of exercise equipment. The tiny waist at left seems more 1910 than 1914. It may have been a “sport” corset. The straps help to “teach” correct posture — and hold up your stockings. Even young girls needed something to hold their stockings up… especially when they were too young to have a waist and hips. 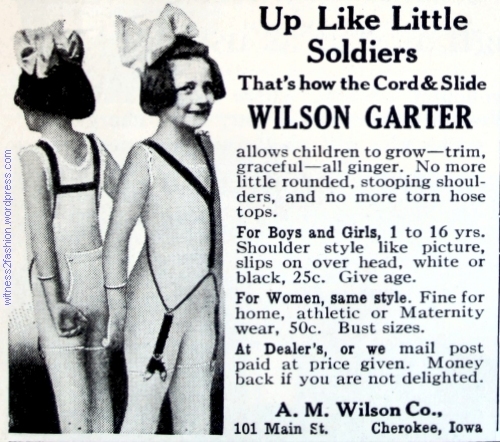 Two girls wear Ferris waists in this ad from April 1917. Ferris Good Sense Corset Waists were “lightly boned and beautifully corded” to naturally develop the growing body into a more perfect figure in later years.” Ad from April 1917. Delineator. Ad from May, 1914, featuring a maternity corset. Maternity corsets were sold by several companies, including Lane Bryant [click here to read more about Lane Bryant;] Sears, Roebuck; and Berthe May. Ferris assured women that the Ferris Good Sense corset waist was not made by exploiting women workers in sweatshop conditions or by piecework in tenements. Ferris ad, 1910. A Ferris Good Sense maternity corset/waist from 1910 clearly was intended to maintain the then-fashionable hourglass figure as long as possible. Ad for Ferris Waists from Delineator, May, 1910. Ferris Good Sense Corsets for girls, starting at age 6 months. If it buttoned up the back, a girl couldn’t get out of it without help. Ferris waist for girls 12 to 17. May 1910 ad. Those hose supporters (stocking suspenders) are really long! An adult corset from 1910 sold by waist size: 19 to 30 inches. Ferris ad, Delineator, May 1910. You can read more about the Ferris Brothers here. Fashion image from Delineator, March 1910. Fashion illustrations from Delineator, August 1920. … in just ten years? This is not a definitive answer — just a large collection of intriguing and sometimes contradictory tidbits I collected last month. “Facts and Figures;” about the new corsets, from Delineator, April 1914. The author is Eleanor Chalmers. Page 38. I’ve been going through magazines from 1910, 1914, and 1920, and there is no doubt that a big change in the ideal figure happened between 1910 and 1914. This 1914 corset article will make more sense if we first look at some images from 1910. Cover illustration, Delineator magazine, March 1910. Full breasts, narrow waist, wide hips: a classic hourglass figure. This is a voluptuous, grown woman in the prime of life. Two curvaceous women wearing Butterick patterns from May 1910. The 1910 beauty ideal is a mature woman, not a teen-aged girl. Of course, not all women looked this way without help. Two 1910 corsets in a “Nuform”/ “Reduso” corset ad. Delineator, March 1910. The Sahlin Perfect Form and Corset Combined was lightly structured, but promised the small-waisted, big-busted look of 1910. Nature’s Rival promised a Perfect Bust: “the full rounded bust form of a finely built woman” — very large in relation to the tiny waist. Ad from Delineator, June 1910. 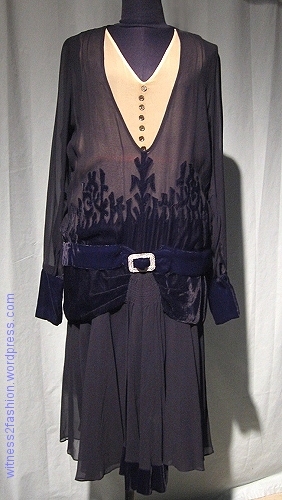 A slender but curvy woman (with an ideal figure for 1910) models a lingerie frock. Fashion illustration, Delineator, April 1910. Shapely — but not necessarily girlish — women, March 1910; Delineator. Even the older woman has a tiny waist. The woman at left is curvy; the woman in the suit at right has the hips of a corset ad. Ad for American Lady corsets, April 1910. Front and back views of a recommended corset, April 1914. “The waistline no longer exists… You obviously can’t have the new straight lines with a curve at the waist and hips.” I was surprised to read this in an article from 1914. 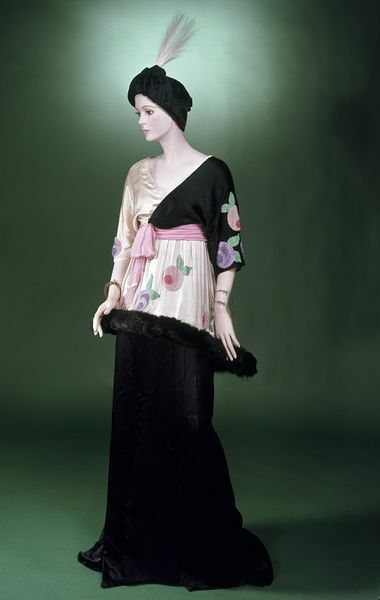 It seems to prefigure (no pun intended) the fashion ideal of the nineteen twenties. First paragraph of Eleanor Chalmer’s corset advice.”The face alone, no matter how pretty, counts for nothing unless the body is as straight and yielding as a very young girl.” Delineator, April 1914. American Lady Corset ad from April 1914. It seems to meet the large waist requirement, but young? Compare two corsets from the same manufacturer, 1910 and 1914. Ads from Delineator. Since the ideal was now a small, low bust, this brassiere for a full-breasted woman confined her breasts rather than supporting them. Ad for a De Bevoise brassiere, June 1914. Of course, what fashion writers tell readers they are looking at, and what we actually see, are not always the same thing. Thomson’s corset ad, February 1914. Her hips are bizarrely long and thin. “New Skirt Models That Widen the Figure at the Hip.” Delineator, March 1914. 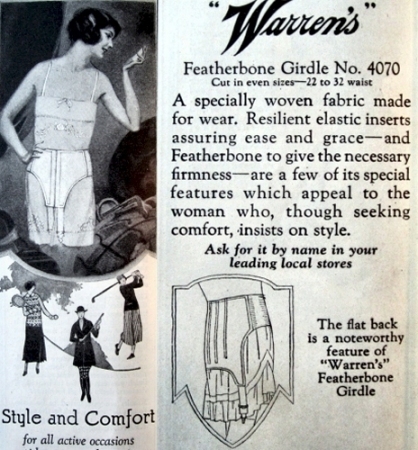 These skirt patterns were shown in the same issue as the corset advice article which emphasized the importance of slender hips. Delineator, April 1914, p 26. It hardly seems worth the trouble of wearing a corset under those skirts. “Saddlebag thighs?” Very chic! However, the waist was definitely getting thicker — and higher. Hard to believe, but the following six outfits are all for girls 14 to 19 years old. The 1914 ideal of a slender, girlish figure does not look as we might expect. More patterns for teens 14 to 19 years old. April 1914. Tiny waists are out of style. Wide hips seem to be in… regardless of that corset article in the same magazine. 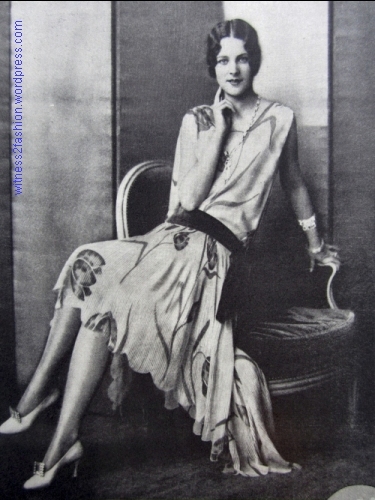 Even though I’ve written about the Tubular Twenties, I was looking for the arrival of the dropped waist; I missed the arrival of the thick waist. Maybe I should have been asking, “When did the waist disappear?” It looks like the answer is earlier than I realized. In 1914, the new style was usually high-waisted, but look at the girl at far left, above. Her waist is almost Twenties…. Butterick fashions for May, 1920. Delineator, p. 151. The wide, loose sash actually adds bulk to the waist. Butterick patterns for March 1914 show a thick-waisted, wide-hipped silhouette. Butterick patterns for January 1924. The line is long and narrow; there is no hint that women have waists. In 1925, another Delineator writer suggested that women had let their figures go during these years of bulky fashions. “A Few Years Ago Women Took Off Corsets . . . and Let Their Figures Go.” — Evelyn Dodge, Delineator, July 1925.